The plan calls for less hockey and more ice fishing. 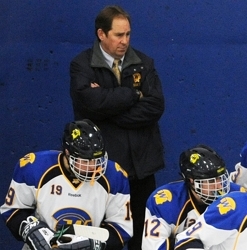 After 31 seasons as a head coach, the last 16 at Wayzata, Carl Davis moved into The Next Stage on Friday, April 22, by resigning his position. Among those interests are outdoor activities. Davis and his wife, Karen, have cabin in the Brainerd area. Davis, who played for legendary Bloomington Jefferson coach Tom Saterdalen in high school, guided Wayzata 247-146-24 record and a state Class 2A tournament appearance in 2004. The Trojans won five Classic Lake Conference titles under Davis. Davis also coached at Buffalo High School for 15 seasons and has a career record of 387-315-43. Wayzata went 20-6-2 last season, when it was ranked as high No. 1 in the state in Class 2A. The Trojans lost in double overtime to eventual state Class 2A champion Eden Prairie in the Section 6AA championship game. “When I try to talk people out of it, usually it’s a mistake,” Wayzata activities director Jamie Sherwood said. “He just thought the timing was right. I’ve got to honor that, though I’m saddened by it. The coaching position opening has been posted on the Wayzata school district’s website. Sherwood, who said there was no pressure from parents or community members to make a coaching change, said he doesn’t know how many applications he'll get for the position. Davis said he expects Pat O’Leary, his assistant for the past three years, to apply for the job. O’Leary, who played at the University of Minnesota, is a trainer for Acceleration Minnesota. Wayzata, with an enrollment 3,508, is the largest high school in the state. The Trojans play in the Lake Conference, widely considered the toughest in the state. Edina, Eden Prairie, Minnetonka and Hopkins are the other conference members. Eden Prairie has won two state Class 2A titles in the last three years. Edina won the state big-school title in 2010. “There’s some people who think we should bring Jacques Lemaire in,” Sherwood said. “There are some who think we should bring in an educator who will be with the kids during the school day.